BB: I’m strongly connected with my divine Spirit and feel strongly guided by my connection to everything. It’s hard to define Who is Betsy because I feel like I’m part of everyone and everything. MJ: You’ve directed five documentaries, on various topics. On Stage (2013), Angela & Althea: A Perfect Match (2013), Breaking Into Bollywood (2005), Something to Cheer About (2002), and New York in the Fifties (2000). How do you select your subjects? BB: I never look for a topic for a film. Usually, the film I’m making is answering some question in my life. One of the messages of my first film, New York in the Fifties, was about someone courageous enough to follow their dream even when others weren’t supporting them, having it fall apart and picking up the pieces and starting over. At the time I was making the film, I was going through a divorce with four small children and my dream of life with my husband and family was falling apart. And then I picked up the pieces of that dream and went on. MJ: I’m sure you get to travel a lot. I know you’ve been to Costa Rica, India, and Zimbabwe, for instance. What is one place that is particularly dear to you? BB: Zimbabwe makes my heart sing. I love the beauty of the land, the kind spirit of the people and the opportunity to be in community with animals especially the rhinos, elephants and lions. MJ: I believe you grew up in Indiana. How was that like? What brought you to South Florida, and what do you like/dislike about living here? BB: I am grateful to Indiana for bringing my former husband into my life who is the father of my four grown children (ages 18-23), for giving me my godparents who gave me the attention I needed when I was young and for the extraordinary friendships I still have in Indiana but Indiana never felt like home to me. My earliest memories of Indiana are of being sexually assaulted several times when I was young and not speaking up about it. I carried those secrets and shame with me for years. Maybe that’s why I was always trying to move away. I’m finishing a fictional memoir about my life between the US and Africa and through the writing, I’ve made peace with those early childhood memories. MJ: What is the biggest challenge in your line of work? BB: I have one film left that I desire to make and the challenge has been to keep the faith in an industry that doesn’t consider me a player. The feature film project is titled Oscar’s Ball and is based on my documentary about the first all-black basketball team to win a high school state championship in the US in 1955. The team was lead by basketball legend Oscar Robertson. His coach was my father’s best friend, Ray Crowe. I’ve dreamed of making this film for 25 years. MJ: What are some common myths about the film industry? BB: I don’t have an answer for that! The market has changed so much in the last few years that I believe now, more than ever, anything is possible. MJ: What are you working on? What’s next for you? BB: I have two documentary films being released in September 2013 and I want to produce Oscar’s Ball but at this point I feel complete as a filmmaker. My legacy as a filmmaker has been to produce important films that inspire, inform, enlighten and entertain. MJ: What is the one film that you’re particularly proud of? BB: I’m very proud of my documentary Something to Cheer About, the film about Oscar Robertson’s high school team. My father died unexpectedly in 1988 when I was 25. His best friend was Ray Crowe, the coach of the team. When I sat down to interview Mr. Crowe and the players from the team in 2000, it was as if my father was talking to me through their stories. MJ: What would you say is the most important lesson you have learned in your life as a filmmaker? BB: There is always a way. MJ: In addition to screenwriting, is there any time of writing you enjoy? BB: I am completing a fictional memoir based on my life between the US and Africa. It’s been fun to write but I still think like a filmmaker. I have more books in me. I would love to continue writing. BB: I have twenty four books on my iPad that I’m reading now (all genres) but I would have to say my favorite writers right now are Andrea, Nick, Christine, Jeannie, Melanie and Maureen, the writers I meet with every week in my writers group in Miami. I look forward to adding their next books to my reading list. MJ: You’re also a humanitarian, the founder of House of Loveness. Why Zimbabwe, of all places? BB: I went to Zimbabwe in 2008 to adopt a baby that had been abandoned. Her name was Loveness and I landed in Africa to the news that she had died. I spent eight days there to organize her burial and during that time met many other abandoned children. 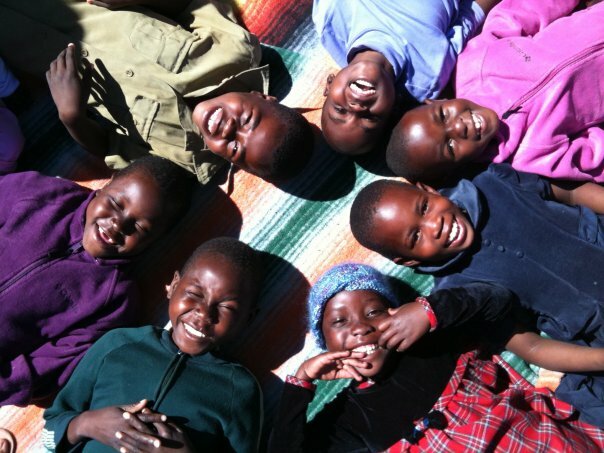 Several of those children are now thriving through the support of House of Loveness, the organization I founded in 2009. Friends and family from around the world have supported my work there. It’s remarkable that one of the saddest moments of my life gave birth to a program that provides care and education for children in Zimbabwe. I now spend 1-2 months a year there working with the children. MJ: You come across as a very private person. What are some things you DO want people to know about you? BB: I’m in my head a lot taking in thoughts and messages that come to me. I value my freedom, meaningful conversation and the deeper connections I find through dancing in community with women and children anywhere in the world. I’ve found a great community of like-minded souls through Qoya (www.wisewildfree.com). I trust that if I’m meant to do something, the way will be shown to me. BB: I’d like to be remembered for being a soulful mother, a joyful storyteller and a woman of reverence. I’d like to be remembered as someone who can weave gold from pieces of the broken dreams of my past.